That is not a Pakur's Bonsai tree . its only a green island ficus ..we often call it Chinese banyan.your ficus is different for its nice looking fruit. 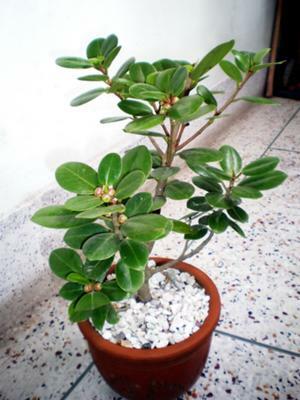 This tree name is Ficus panda, this is one kind of Ficus tree. I have one of this, its my first time to make a bonsai. Here is a bonsai association in Dhaka, but I don't have any communication with them, but I have to. Than for ur nice try. It is a photo of PAKUR TREE/ASWATHWA TREE/PEEPAL TREE. First of all this is not a Pakur Tree, Rather it is a Ficus, known as China Bot in Bangla. I think you may take heplof some book which are available in internet. best of luck.